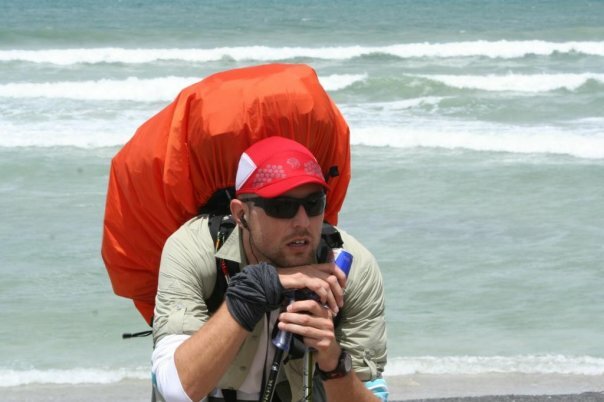 Day 1 (Sun, 8 Nov): he put in a solid 46km from Cape Point into Cape Town – in the rain. Day 2 (Mon, 9 Nov): Ray was picked up by the cops; not for doing anything wrong, but because they were concerned about his safety. Crime is rife along the N2 and he is carrying a backpack loaded with cool gear that he is testing. Day 3 (Tues, 10 Nov): He started where his friend at picked him up – from under police protection – the previous day. He spent the day walking into a driving headwind. Ray passed through Stellenbosch and spent the night camping in the police station grounds of Pniel. Day 4 (Wed, 11 Nov): Ray awoke after a night spent with his tent battered by strong winds and pouring rain. His mood was lifted when a stranger, who’d been following him on SportsTrack, brought him a cup of coffee on the road. After slipping on the railway tracks and injuring his knee, Ray made it through the Du Toitskloof tunnel and spent the night in the grounds of a lodge on the other side. Day 6 (Fri, 13 Nov): Ray headed to Toeka, through Worcester, stopping to make an appearance at the Cape Union Mart. He spent the night behind a garage in Toeka. Day 7 (Sat, 14 Nov): Prior to his departure, Ray had battles with the railway people – they wanted to stop him from following the line. On this day he finally reached the section of line that was part of his original route plan. The day was not without excitement. It included encounters with children wanting money and a conversation with a child who wanted his cellphone. Ray passed through a number of train stations that are no longer used and was advised many times by DeDoorns locals about the safety hazards of the area. Day 8 (Sun, 15 Nov): Ray’s day started with a jaunt through a squatter camp near the line and passage through a tunnel used by the locals as a latrine… he also picked up a tail, which he lost after he picked up his pace. He travelled through another tunnel, making it out just before a Rovos Rail train approached, storming along the tracks. His next tunnel was 13km long – and he has two train encounters, ducking into ‘cubbyholes’ inside the tunnel when they passed! But nightfall Ray was ill, probably from contaminated river water. He does filter his water and add purification tablets, but it wasn’t enough. Day 9 (Monday, today): Ray is still ill and vomiting. He has decided to rest today to recover. “I’ve re-filtered the water and dropped in another round of tablets… and it seems to be ok this morning. I haven’t been sick, but am exceptionally weak & can’t even look at food! Not a good sign when I only have 500ml wate left. I HAVE to make it to the dam about 2km ahead today to re-supply… further than that I am not concerned. Ray is posting superb updates on his website, www.raychaplin.com and also through Facebook, with photos. You can also follow him through SportsTrac. All links on his website.